What is A-WA? Three letters that you may not know how to pronounce (for now). Three sisters whose sweeping and uncompromising creation will take you on an exciting journey. So says the A-WA website. Abq Jew first learned about A-WA from this March 23 article (by the aptly-named Avishay Artsy) in Jewniverse. On March 8, a music video uploaded to YouTube flew from the Israeli desert to Yemen and through the Middle East. Its three stars, sisters Tair, Liron and Tagel Haim (not to be confused with L.A.’s three-sister rock band Haim) became immediate celebrities. Going by the name A-WA (pronounced Ay-wa, Arabic for “yes”), the young women sing in Arabic, wear bright pink dresses and head scarves, and tear through the desert in a Yemeni jeep. Then they dance-battle three guys (potential suitors?) wearing matching blue Adidas tracksuits. 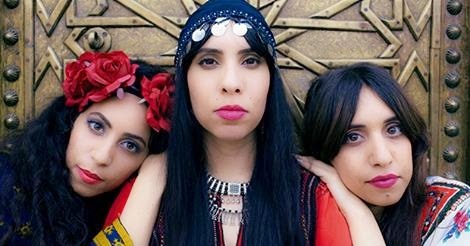 Their first video, Habib Galbi, which was viewed over 500,000 times around the world in the two weeks since its release, layers beautiful Yemenite melodies over irresistible hip-hop beats, creating a fast-paced, danceable fusion of Middle Eastern musical traditions. To tell the story of A-WA, we have to go a few years back, to a family who lives in the small village 'Shaharut' in southern Israel. Not too far from the Egyptian border. In beautiful prairie landscapes with magical desert sunsets, Tair, Liron and Tagel grew up - three sisters (out of six siblings) to the Haim family. The rest, as they say, is history. Or, as we Jews say, History.